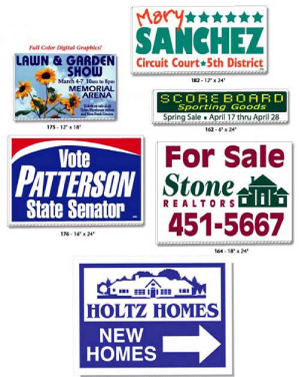 Yard signs can be used for advertising to promote home sales, rentals, businesses, events, or political campaigns. CV Graphics manufactures wholesale yard signs using a state of the art screen printing process or digital printing. Our corrugated plastic yard signs are made from long lasting, weather proof 4 mil corrugated plastic and are screen printed with environmentally friendly UV inks for durability. 24 x 18 Political, Business and Event Yard Signs - Corrugated Plastic - Made from long lasting, weather-proof 4-mil corrugated plastic. Corrugated plastic yard signs are lightweight yet extremely durable. Fluting creates a yard sign that is exceptionally sturdy as well. They can be placed in a wide variety of outdoor locations -- from well-travelled street corners or job sites to front yards! Available with white or yellow backgrounds. UV Screen Printed for indoor and outdoor durability.